The Douglas Charles Airport could reopen later today according to a release from the Ministry of Public Works, Water Resource Management and Ports. The airport was closed after the left landing gear of a Sky high aircraft collapsed soon after landing at about 12:30 PM on Monday. “The aircraft touched down about 135 feet from the threshold markings and the left landing gear collapsed soon after landing. The aircraft veered towards the left side of the runway and the other landing gear collapsed. The aircraft then stopped in the grass area between the taxiways B and A. A small fire on the aircraft was quickly extinguished by Government’s Fire Services,” the release stated. It added that the three (3) member crew and the twenty-nine (29) passengers exited the aircraft and were escorted to the airport terminal for further medical examination. No major injuries were recorded at that time. 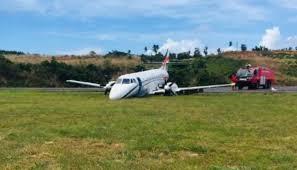 The release went on to state that Dominica Air and Sea Port Authority notified the Eastern Caribbean Civil Aviation Authority (ECCAA) within minutes of the accident, in keeping with ECCAA procedures. It further stated that efforts were made to have the ECCAA officials arrive on island Monday April 8, 2019. However, due to circumstances beyond their control ECCAA could only arrive on island on the morning of Tuesday April 9, 2019. “We expect that once ECCAA officials give the all clear, normal Airport operations will resume, hopefully by early afternoon on Tuesday April 9, 2019. DASPA will continue to monitor the situation and advise the general public accordingly,” the release stated. Below is the full text of the statement from the Ministry of Public Works, Water Resource Management and Ports.